There is a range of NASA experiments, instruments and applications where miniature pumps are needed. To address such needs, a piezoelectrically actuated miniature pump is being developed under a NASA Code S PIDDP task. This pump employs a novel volume displacing mechanism using flexural traveling waves that acts peristaltically and eliminates the need for valves or physically moving parts. This pump is being developed for planetary instruments and space applications. Finite element model was developed using ANSYS for the purpose of prediction of the resonance frequency of the vibrating mode for the piezopump driving stator. The model is used to determine simultaneously the mode shapes that are associated with the various resonance frequencies. This capability is essential for designing the pump size and geometry. To predict and optimize the pump efficiency that is determined by the volume of pumping chambers the model was modified to perform harmonic analysis. Current capability allows for the determination of the effect of such design parameters as pump geometry, construction materials and operating modes on the volume of the chambers that are formed between the peaks and valleys of the waves. Experiments were made using a breadboard of the pump and showed water-pumping rate of about 4.5 cc/min and pumping pressure of 1100 Pascal. The pump is continually being modified to enhance the performance and efficiency. U.S. Patent No. 5,630,709, May 20, 1997 Y. Bar-Cohen, "Pump Using Pistons And Valve Made of Electroactive Actuators"
U.S. Patent No. 5,961,298, October 5, 1999 Y. Bar-Cohen, B. Joffe and S.-S. Lih "Traveling wave pump employing electroactive actuators"
A demonstration was made during the JPL 2000 Invention Challenge, December 8, 2000. 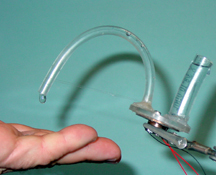 The demonstration was entitled "Plumbing-free water fountain using high-power focused ultrasonic waves."